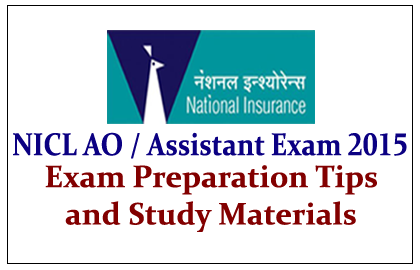 Exam Preparation Tips for NICL AO /Assistant Exam 2015 was given below, candidates those who are preparing for those exams can use this. Before you start your preparation, initially make it clear about the syllabus and question paper of the examination. If you understand the syllabus clearly then you can be confident of your preparation, and knowing the question pattern will help you to estimate the section wise marks that you need to be scored in the examination. After analyzing the syllabus and question paper, next you have to know your weakness, i.e., in which sector you are poor and in which section you need to concentrate more. For Example, if you are strong in GK then spend less time to prepare for it and if you are weak in Aptitude then focus more on it. To get more ideas about the question pattern you can compare the previous year question papers, it will give you more confident to get more marks in the examination. You can practice with the model question papers to get experience and ideas about the examination. Practice questions are available in both online and offline and try those practice questions in time bound manner, fix the time for yourself and try to complete in within the time. While preparing, make you more comfortable, change the topic if you get bored or tired then skip to interested syllabus. For Example: If you are preparing for Aptitude for a long time then definitely you will get bored and lose your concentration at that time move to the another interested topics like computer or G.K. This is the very important point the all the person those who are preparing for the examination. They should know their Strength and Weakness, and then they had to allocate their time for the preparation.